♦ Institutional investors are increasingly seeking low-volatility returns, and have resorted to investing in short-term "events" toachieve this. 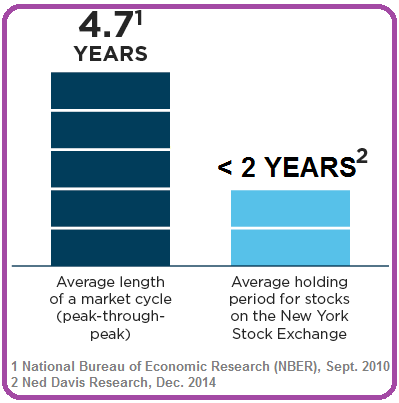 ♦ As a result, average holding periods have decreased to less than 2 years (ca. 18 months) today. ♦ This is great opportunity for long-term investors. If we're willing to look beyond the market's horizon of 18 months, we can receive the value of future positive developments for free (oh wow = a "FREE" lunch? well; Patience is precious).